Chileans love their bread, and it is a common Chilean food. Chilean pan amasado is a classic kneaded bread that is relatively easy to make. Literally translated, pan amasado is “kneaded bread”. There are various recipes of how to make Chilean pan amasado. Common ingredients include flour, yeast, salt, shortening, sugar, and water. 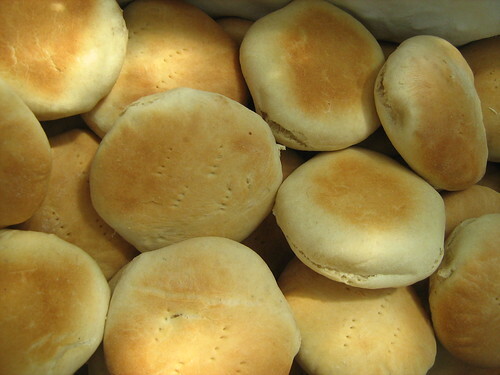 Regardless of recipe, you’ll mix the ingredients, knead the bread, let it rise, divide into smaller rolls, and bake. Pan Amasado Recipe with just flour, salt, shortening, water, and yeast. You’ll notice in the video that she adds some powdered milk to the mix, which isn’t used in some other recipes (like those I list above). If you can’t make the pan amasado yourself, there are plenty of options available to you while in Chile. It seems the best Chilean pan amasado comes from roadside vendors on the outskirts of the city. They have large adobe or earthen ovens they use to cook the bread. I always seemed to see these types of vendors on the edge of the city, regardless of size, where the city starts to turn into countryside. These same vendors may also bring their bread into the city for sale in small stores or markets. In the heart of Chile’s cities, you’ll most likely find pan amasado at the local bread store called a panadería. Like most fresh breads you’ll find in Chile, pan amasado is best served warm. The warm bread makes anything you serve with it taste that much better. Traditional toppings include the sweet manjar, avocado, tomatoes, fruit jams, and cheese. Find some Chilean pan amasado and enjoy! Those look great, can’t wait to try the recipe. She did not say at what temp to make them and for how long, will you let me know? Thanks!